• Power and energy efficient. • Adjustable head and flexible arm. • Switch on lamp shade. This lamp has "eye protecting" feature specially designed to cut glare and provide soothing illumination. Power and energy efficient, long lasting bulb (included). Adjustable head and flexible arm enable more comfortable positions. Switch on lamp shade, U.L. approved. 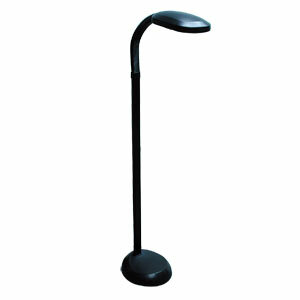 With head bent in standard in-use position, lamp measures 4'1" tall. Perfect for use with any seating arrangement.